I’m not even entirely sure what’s going on, but we’re picking this up now or something. If you somehow don’t know already, Houkago Play is a series of volumes‒3 thus far‒that centers around a different couple with each volume. Volume 1 was translated already, and Volume 2 was started but stopped due to a myriad of problems, apparently. So yeah, here we are. Joys of not having a dedicated TLC, but that’s okay, I’m sure the points get across. I promised a /a/non that I would get the next one done within 24 hours, so I kept my promise. This one’s for you. I know Anonymous has done up to, what, Chapter 4 already but as a leader I definitely didn’t want to waste the efforts of にんげん (I made him stay up until 3 AM) and our fabulous new cleaner ツインテール (his editting is absolutely incredible). So until Chapter 6, this series is inactive, sorry! Even if our dear anonymous friends end up doing it again. [Edit] /a/ finally finished Chapters 4 and 5 with unparalleled speed. Check out the nice and organized pastebin for links! Since I’m somewhat convinced we’re on the RSS feeds of some people already, I would like to say if you have the reader‘s RSS feed, you should update it to [the current one] because I spent half of my day trying to fix DNS problems for you. Yes. You. The old URL will just redirect to the current one. Better to fix it now, than in the future. Unless, you know, we die again or something. Also Cosmos 4 is nearing the end of the translation phase, and already past cleaning. In the meantime, have one of the few panels that manages to not spoil anything. So yes, I would like to say I’m not dead and neither is the group. I was indeed bed-ridden and ill from June 16-24 with what is called E. coli, that I contracted while on a business trip to Florida. Being that I have a terrible phobia of hospitals and such, I confined myself to my bed to try to get over it. Anyway, upon recovery I immediately got on the nearest plane to meet up with にんげん (Katakana naming is a in-joke, I’m sorry) and proceed to scan the full volumes of Cosmos we had. But alas, it is dear にんげん’s turn to go somewhere, and will be away for approx. two weeks without definite computer access. We will strive to release the next chapter regardless of the circumstances. Also, SemiHen has been MIA from what I have been told, so Hen-Zemi is now in limbo for the time being. Again, I’m sorry. No, it’s not dropped, just… delayed! If it’s dropped, I’ll say something. We here at World Three decided to take on a huge undertaking. So huge in fact that I had to take a plane to meet にんげん in person to accomplish it. And that ‘thing’ is “I Love You!! Magical Angel Cosmos”. Minazuki Suu (of Sora no Otoshimono and Gou-Dere Bishoujo Nagihara Sora fame) is the man behind this. 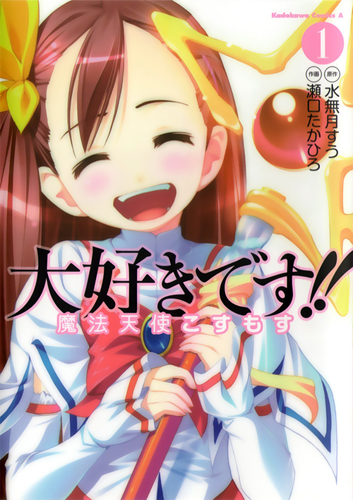 I found it while browsing one day and learned that this particular title hasn’t been scanlated, let alone really talked about. So, we bought it, met up in person, put our brains together to scan it (which we’ve never done before), and got to releasing. So here it is. No idea how our schedule will turn out, since this is a monthly manga resulting in long chapters. We’re hoping to do it bi-weekly, but you never know. We will get better at this whole process as time goes on, resulting in me forcing a v2 in the far flung future. I bet. As for Hen-Zemi, we are currently speaking to SemiHen Scans on how it will progress in the future. Sorry if you’re wondering. Sorry about the delay, I’ve been fairly ill the past few days. As if that stops me. 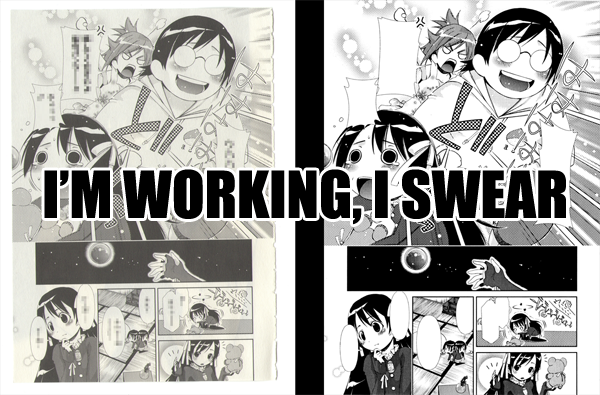 I might go about v2’ing these two chapters someday, if I feel like it.